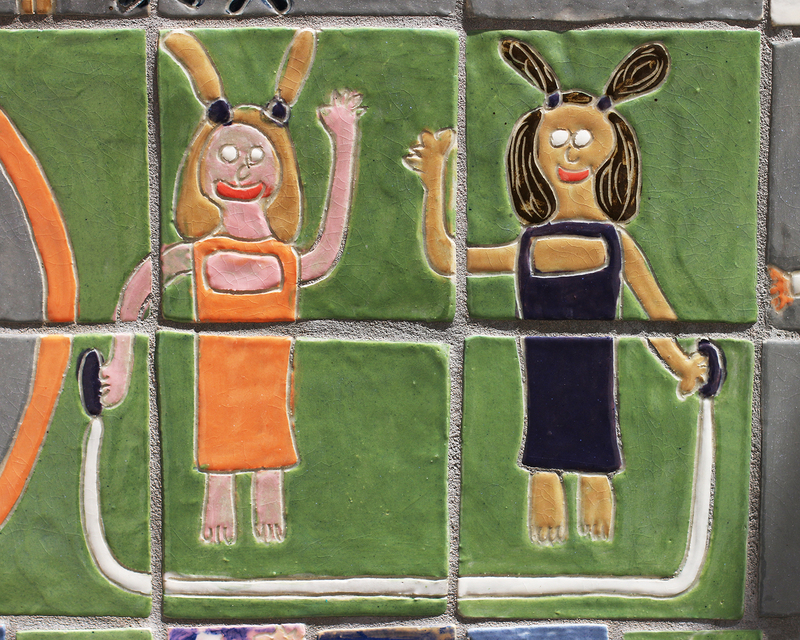 On the giant front wall of our elementary school there are scenes depicted by children on hand-drawn, hand-painted tiles (created by former students) of activities going on in and around the school. Since the nickname Leslie assigned to her eldest daughter is Bunny, because she was born in the year of the rabbit, I thought this would be a cute detail to share here. In the larger picture, it’s a nice way of idealizing that anyone can make friends at school; find similarities or common interests so school can become more fun. Right, Bunny? Art produced by children in the ages of 5-11 years old has a special quality to it. The innocence is palpable. There are major details included, gestures of others included. Such as, there are eyes, yet no pupils. There are hands and feet, and the idea of toes and fingers. Why not have them wearing shoes? And of course, the fantasy ears…I don’t think this was showing a hairstyle of front forehead placed ponytails since human ears were left off their heads. Anyhow, it’s sweet, I liked it and I’m sharing with you. What do you read into it?